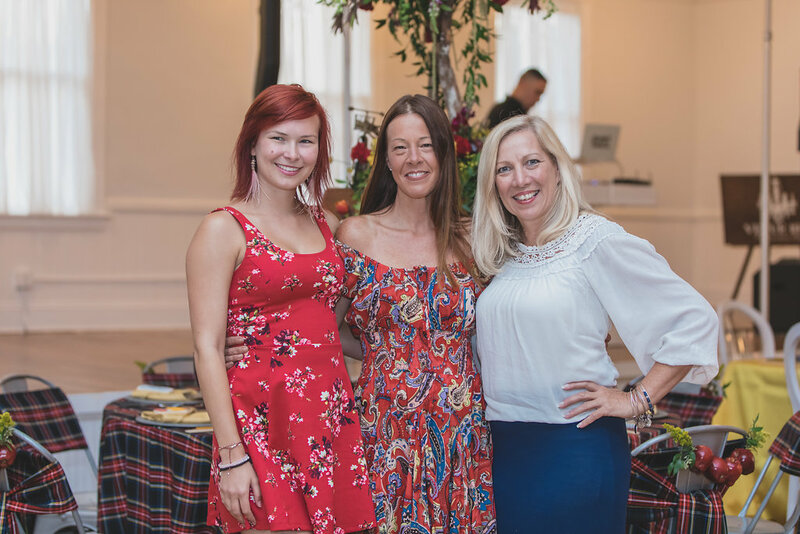 This past August, we co-hosted a local wedding industry networking event with Venue 1902 at Preservation Hall. 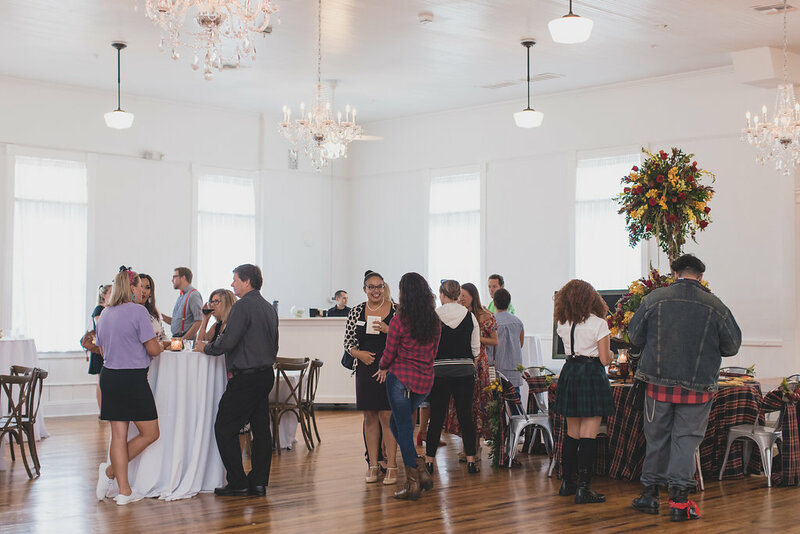 Venue 1902 is a renovated old school house and since it was that time of year, we figured what better theme than "Back to School"! 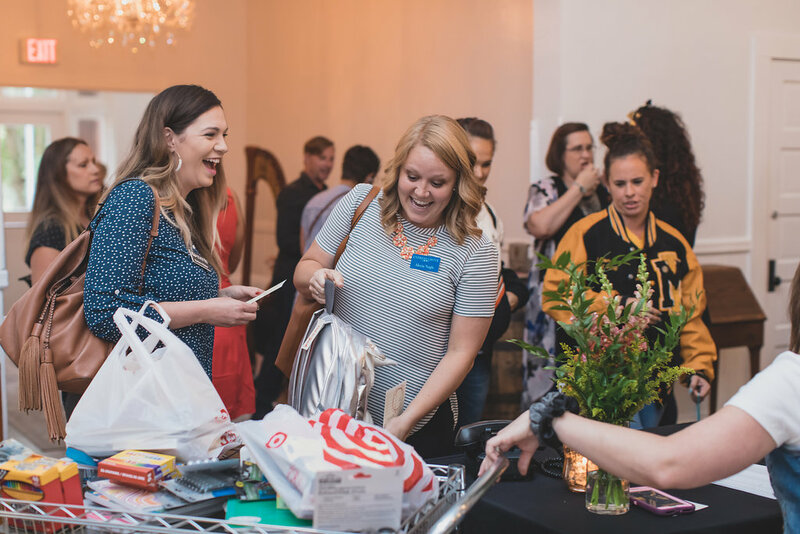 The event had absolutely amazing vendors, including wedding planners Kyla and Tasha from Everlasting Events who helped pull the details together. As part of the festivities, we had a Back to School design competition. 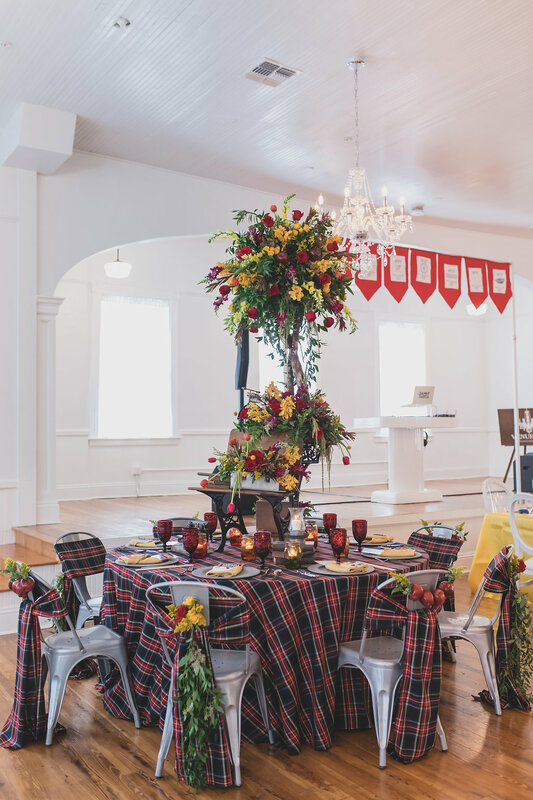 Three local florists, Atmospheres Floral and Design, Lee Forrest Design, and Orlando Flower Market, were asked to design a school themed reception table and our guests would vote on their favorite design. There were only two rules: the design had to be school themed and they had creative freedom. And these florists did not disappoint! 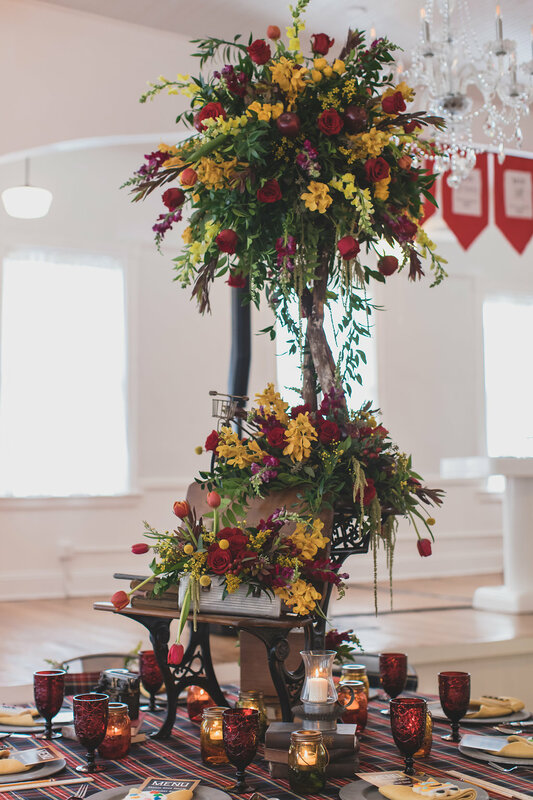 Using linens from Over the Top and rentals from A Chair Affair and Orlando Wedding and Party Rentals, each of the designs were so unique and reflected their floral/design style perfectly! 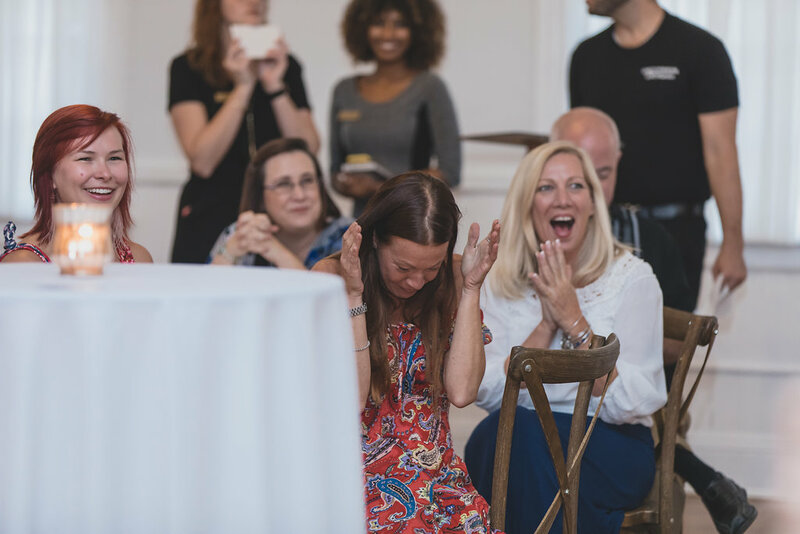 Check out all the gorgeousness (including the winner) and more from the event below! 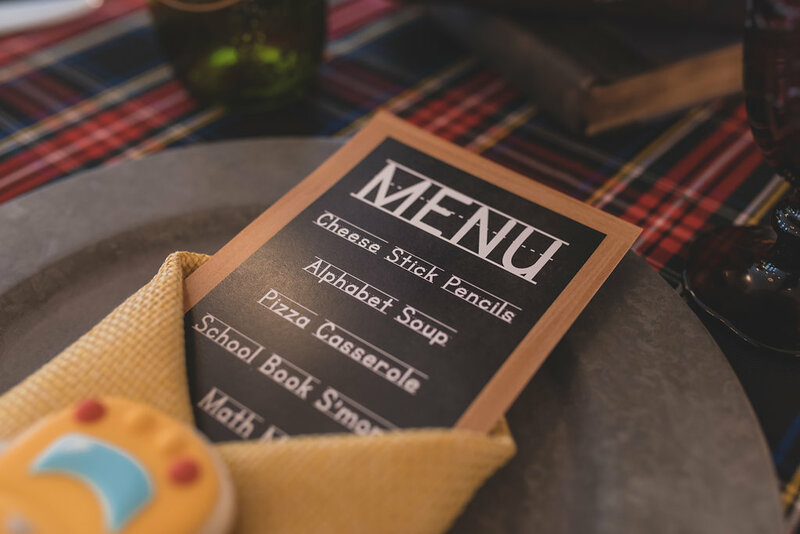 "When asked to design for the "Back to School" themed challenge at venue 1902, I was extremely excited. 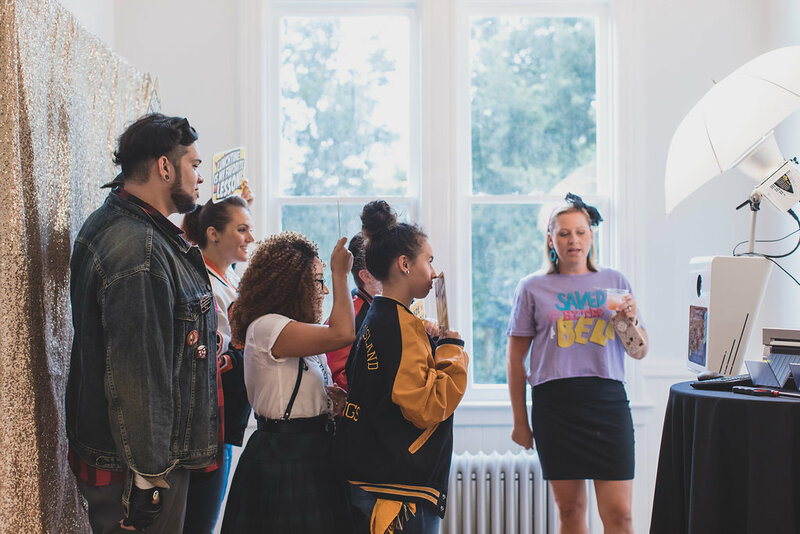 I immediately knew that I wanted to focus on the history of education in America as I have always been fascinated with the stories my elders told me about their experiences when they were in school. Given that, I decided to incorporate some family heirlooms into my design. An early 20th century eclipse school desk, vintage school books, metal lunchbox and goblets. My objective was to allow our guests travel through time from the early 1900s to the present. 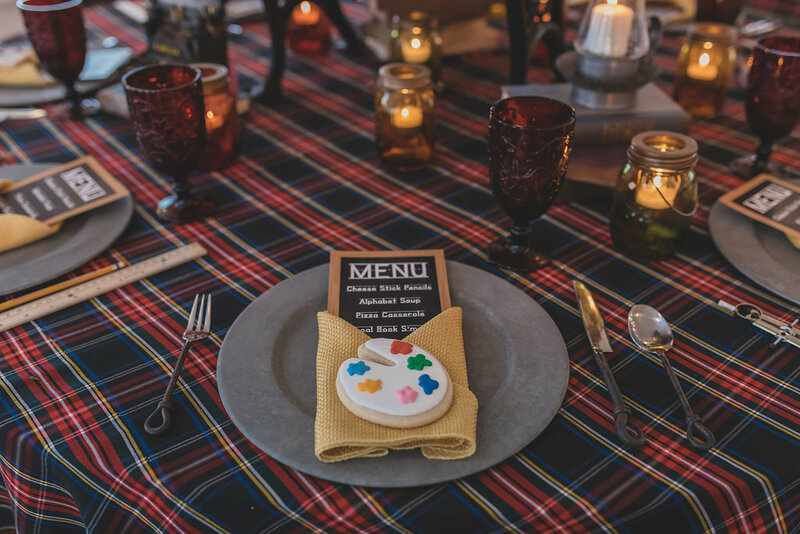 To smell parchment and cookies, to feel the wood iron and woven fabrics, to see the bright array of fresh florals and dripping foliage. You could almost hear the school bell ring! 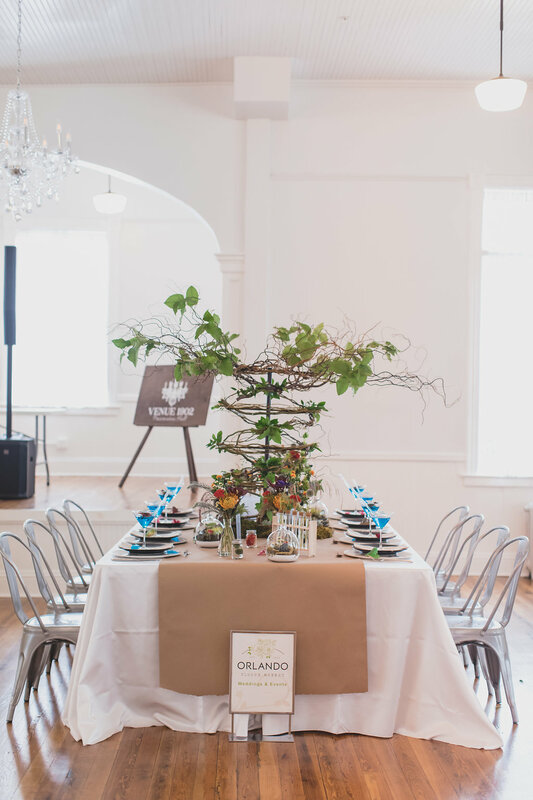 Additional elements in my table design include a dragonwood tree, typewriter, bicycle, colored mason jars, tin chargers, card file cabinet, chalkboard menu cards, vintage iron flatware, rulers, pencils, compasses,custom cookies, metal chairs, fresh apple swags and greenery garlands on plaid chair sashes." 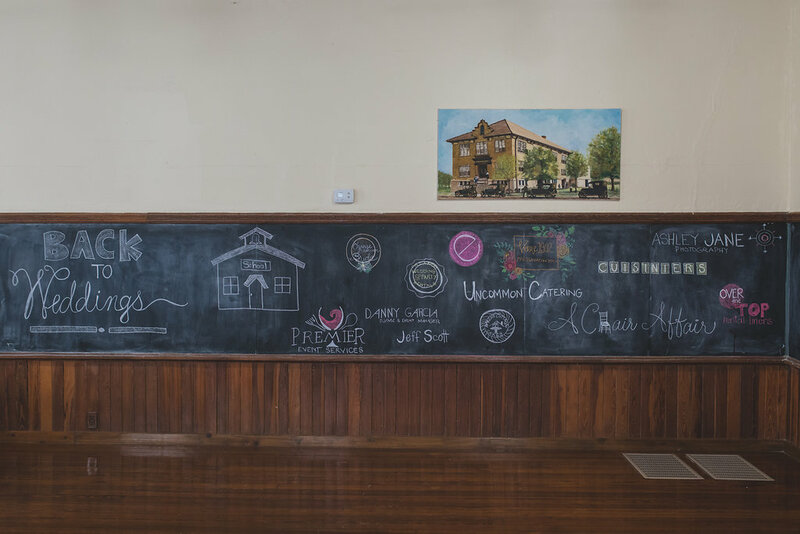 "When I was a student at Transylvania University, I studied a lot of art history. My favorite artist of all time was early 20th century Dutch artist, Piet Mondrian. 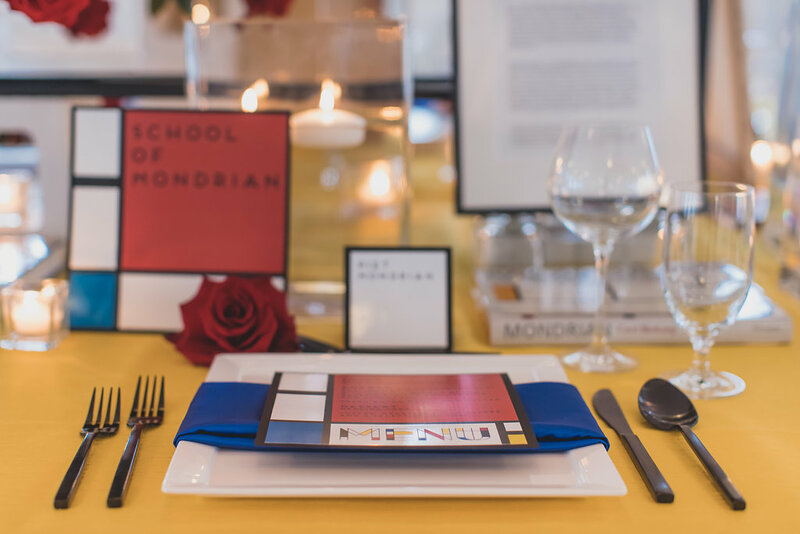 My "Back To School" design challenge is inspired by Mondrian, with each element of the table reduced to the three primary colors (red, yellow and blue), the three values or non-colors (black, grey and white), and the two primary directions (vertical and horizontal), with straight lines separating square and rectangular planes. 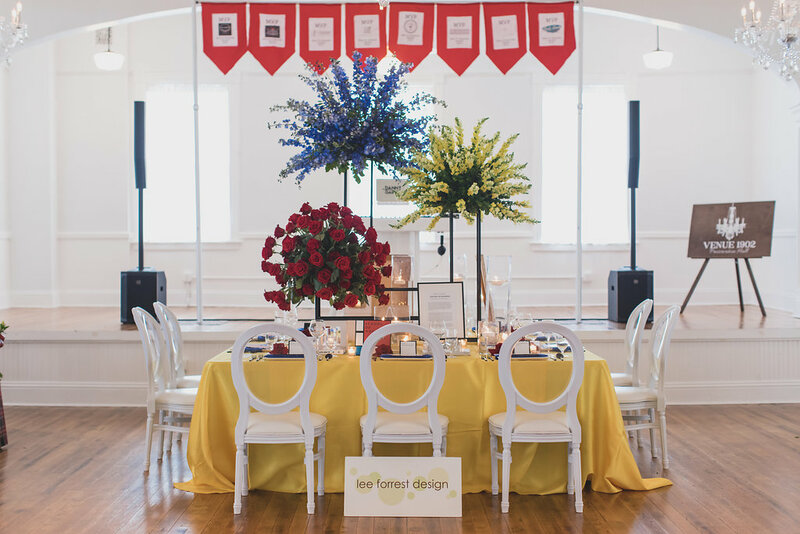 This aesthetic has influenced my own living style and my floral design over the years, in keeping with my own preference for clean modern lines, simple shapes and bold colors. 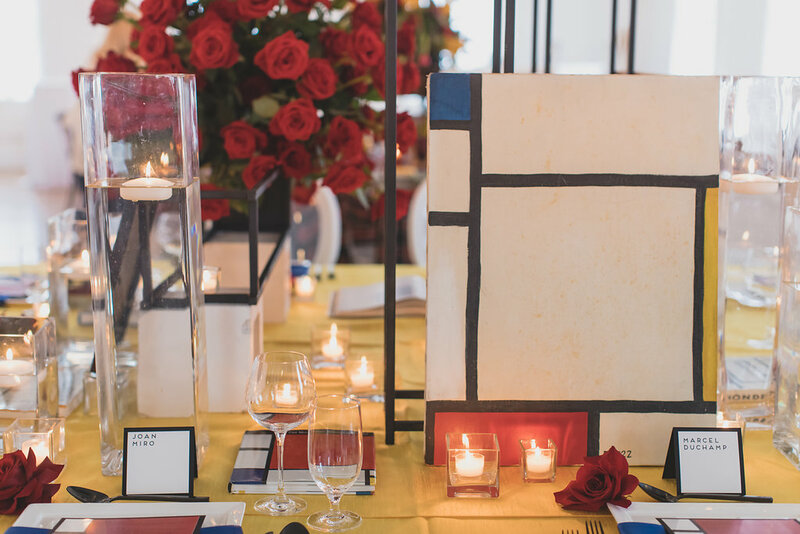 In keeping with the "Back to School" theme, my table is composed of concrete blocks, glass and metal--all of which are elements that are used in building modern day schoolhouses, another nod to our theme of "Back to School, Back to Weddings." 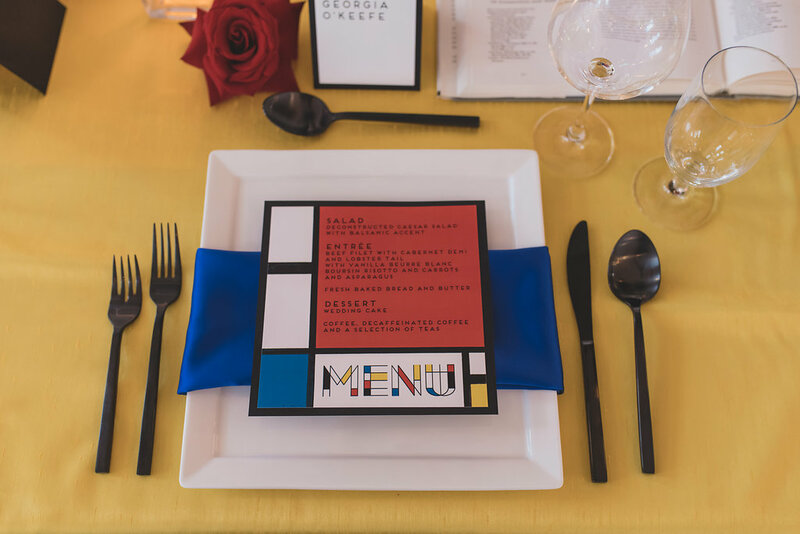 This table would be totally appropriate for a wedding of an art teacher or an art history student." 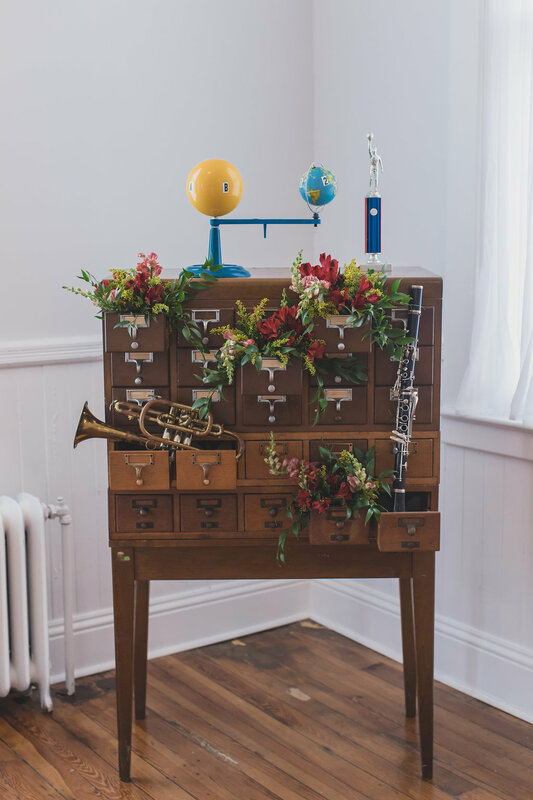 Lead Designer, Molly, of Orlando Flower market, created an amazing design with so many beautiful details for her science class inspired table. 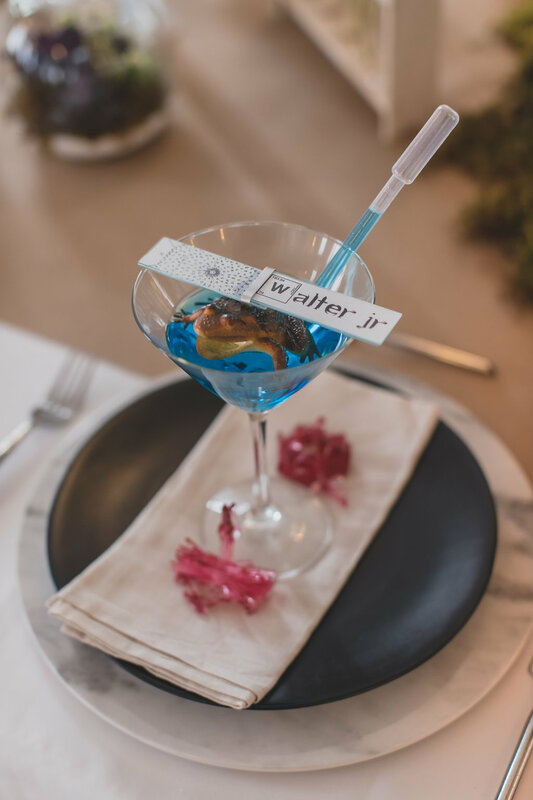 Using beakers and test tubes for vases, martini glasses with little amphibian friends and test strips for place cards, Molly's design was definitely a science experiment gone right. The attention to details was amazing! She even grew the crystals used. 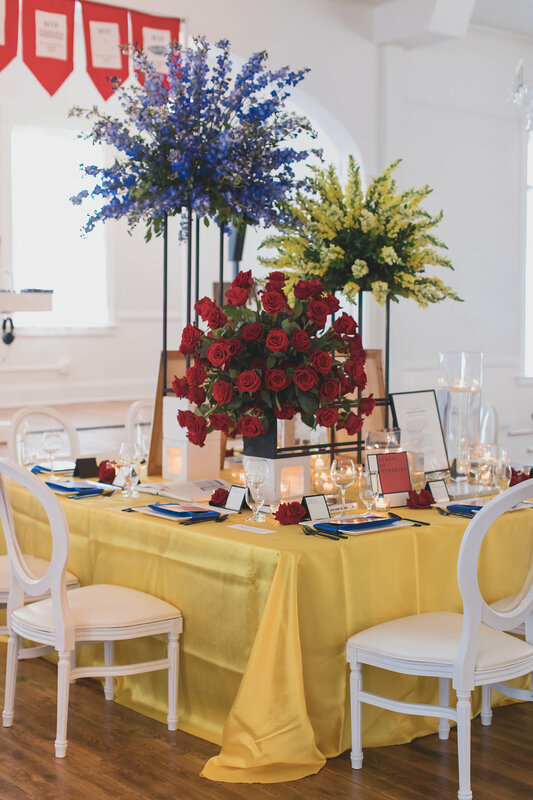 The focal point of the table was the centerpiece. Vines were intricately wrapped to create a double-helix. 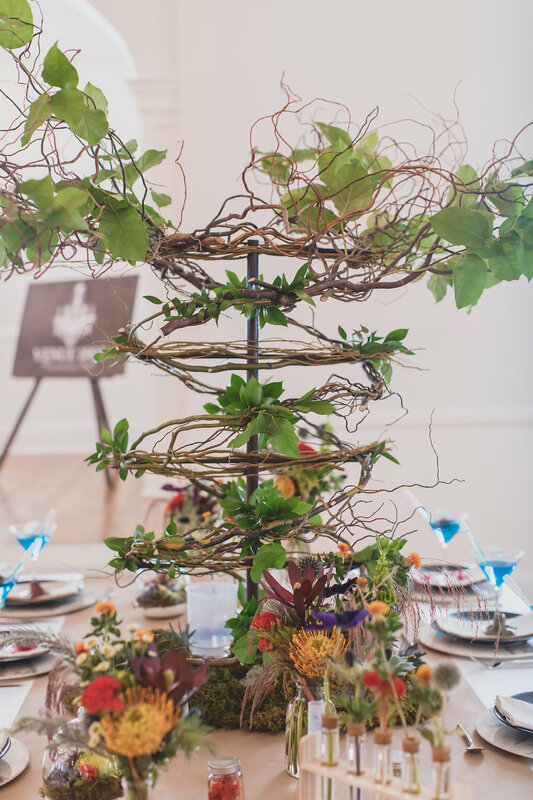 The base of the centerpiece was covered in moss and beakers with dry ice surrounded to give it that experiment in action feel. To get in the spirit of the theme, we asked guests to dress as their favorite school character. It could be a specific person, like the Plastics, a nerd, jock, etc, or a decade, like the 80s/90s. Guests then voted on the best costume. 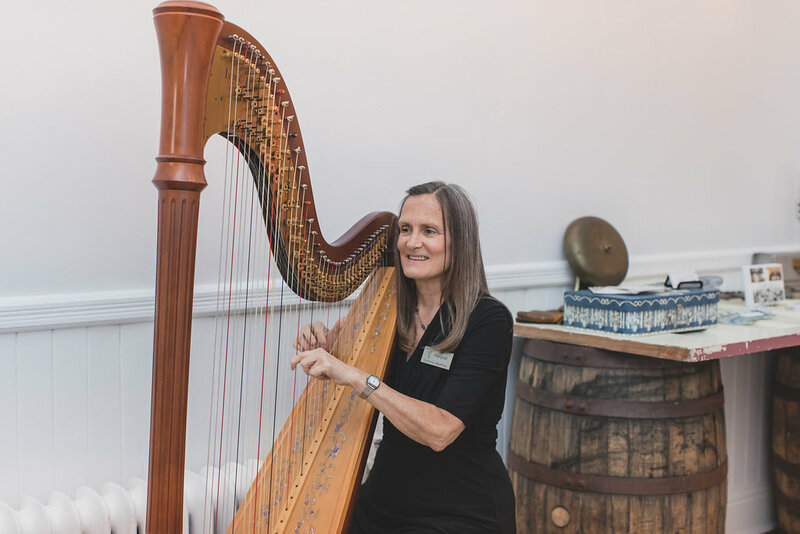 When guests arrived, they were greeted with beautiful music from harpist Christine McPhail. 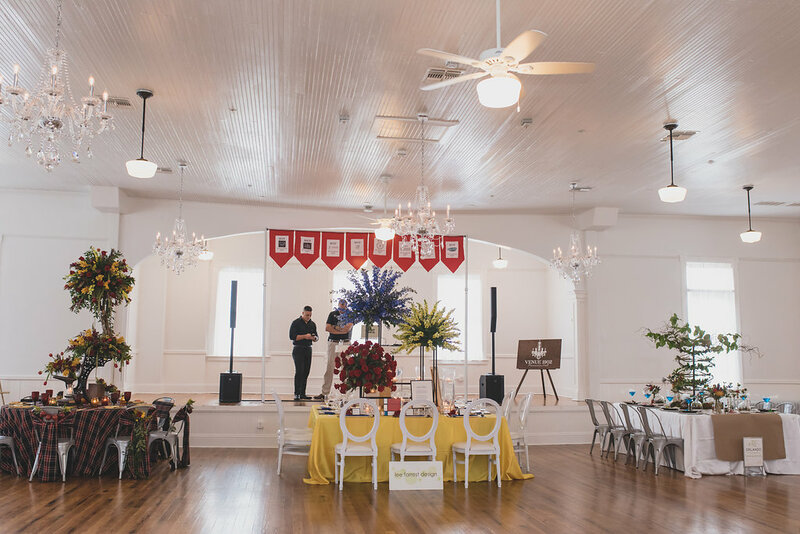 Venue 1902 was a great venue to host this event as they have a variety of different spaces on the property. 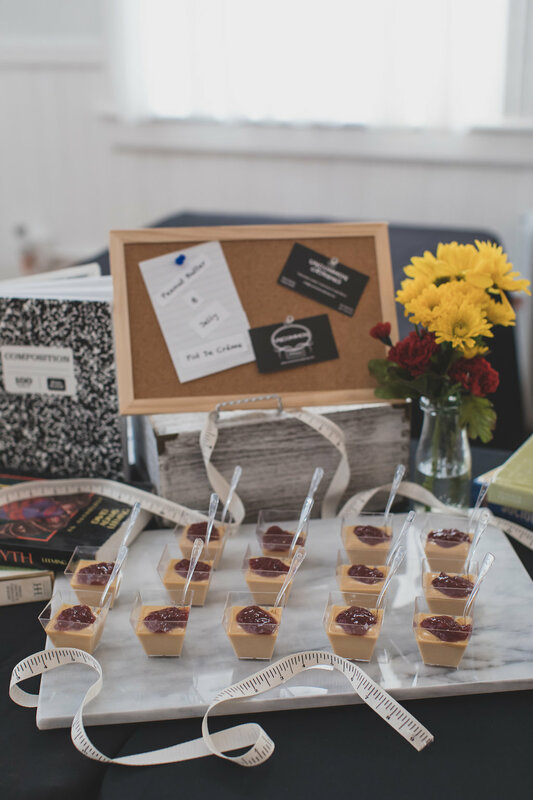 Delicious appetizers from Uncommon Catering and Cuisiniers, wonderful signature drinks from Premier Event Services, and amazing cake shooters provided by Bakers Cottage Cakes were available for guests to enjoy. 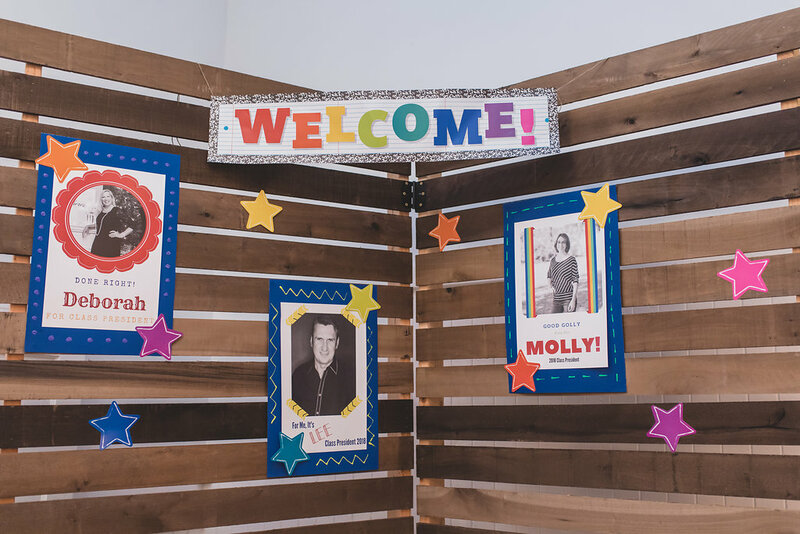 Along with the other festivities, Party Shots Orlando provided a photo booth with fun school themed signs for guests to showoff their attire. DJ Danny Garcia provided the music for the evening while Ashley Jane Photography and Lillian Shawn Imagery.